If you have a problem accurately selecting objects on your Windows 10 screen using touch, you can calibrate your screen alignment. In this case, calibrating means to help Windows 10 understand what constitutes a tap on the screen. On the Start screen, type tablet pc. Then select the Tablet PC tile in the Search results panel. 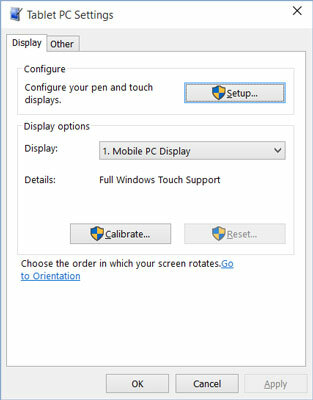 In the Tablet PC Settings window, select the Calibrate button, as shown. User Account Control may ask you to confirm that you want to run the Digitizer Calibration Tool. If so, select Yes. If your touchscreen is badly calibrated, you may not be able to tap the Calibrate button. In that case, plug in a mouse to make the selection, and then continue using touch. The screen displays lines around its perimeter, forming a box near the edge of the screen and a second box inside the first about half an inch from the edge. Lines connect these boxes near each corner. The result is 16 intersections. Starting at the upper-left corner, use your finger or a stylus to tap each intersection, which displays two short black lines forming crosshairs. As the crosshairs move, tap the highlighted intersection, left to right, down, and then left to right again. The process takes much longer to read about than to do. If Windows 10 doesn’t recognize your touch, it won’t continue with the process. The screen says Right-click anywhere to return to the last calibration point. What if you don’t have a mouse? Tap and hold until you see the little box under your fingertip, and then release — that’s the touch equivalent of a click of the right mouse button. After you have selected each of the 16 calibration points in turn, a box pops up asking whether you want to save the calibration data. Select OK unless you think something went wrong. In that case, select Cancel.